Brief Synopsis – When his father dies, an LA yuppie learns that he has an older brother living in an institution who has inherited all of his father’s money. My Take on it – I recall seeing this in the theater and enjoyed it even then. Dustin Hoffman obviously steals the show as Raymond (Rain Man) and Tom Cruise is also great as his yuppie younger brother Charlie. During their trip across the US, Charlie learns a lot about himself and about his life that he never considered beforehand. This movie has been compared many times to Forrest Gump (1994), and it’s interesting that both were originally in development at the same studio and the studio didn’t want both of them because they feared that neither would be a hot. I believe that even 25 years later, they are still kicking themselves over that decision. Winner of 4 Oscars (out of 8). It won Picture, Director, Actor [Hoffman, his second win after Kramer vs. Kramer (1979)] and Original Screenplay. It lost Music, Art Direction, Cinematography and Film Editing. It’s actually interesting that Cruise wasn’t nominated since Charlie actually went thru a greater catharsis and transformation than Raymond. Hoffman won because of his portrayal of Raymond not because of his transformation. He definitely deserved that win. 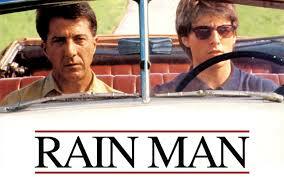 In high school, I had a friend who would constantly walk around quoting Rain Man, so I know many of the minor lines by heart after having heard them so many times. Bottom Line – Great road movie. Both Cruise and Hoffman are great. Highly recommended!